Coming up on September 29 & 30, 100% of the proceeds from Elysian Brewing’s 13th Annual Great Pumpkin Beer Festival will go to support the Fred Hutchinson Cancer Research Center. This is just one of several ways that Elysian has supported Fred Hutch in recent years (more info below). Regardless what you do or don’t think of Elysian’s connection to AB, you have to give the brewery credit for going above and beyond to support a very worthy cause. The event moves to Seattle Center this year, where you’ll have 80+ pumpkin beers to choose from. For all of you pumpkin beer haters: whatever. More for my wife and me. There is plenty of room in my life for both fresh hops and pumpkin beer. 2017 marks the 13th year for Elysian’s Great Pumpkin Beer Festival – and we invite you to join us at a brand new location – the Seattle Center, where 80+ pumpkin beers (plus a couple surprises) from near and far will be poured, including twenty or so from Elysian’s pumpkin-crazed brewers and their collaborators. In addition to loads of pumpkin brews, local food trucks, Chaotic Noise Marching Corps, KEXP DJs Riz Rollins & Stevie Zoom, pumpkin carving, and fall festivities scattered throughout the event – New to GPBF this year (drumroll please…) we are partnering with FRED HUTCH! For those who haven’t been to GPBF – during each session, we have a giant, several-hundred pound pumpkin that is scooped, scorched, filled with Elysian pumpkin beer, sealed, conditioned, and then tapped at the fest for all to enjoy. As you know Orange is the theme – interpret that as you will but the more orange, the better! …and if you want to bust out a full costume, that’s always encouraged! Each day of the festival, some of our finest will be roaming through the crowds to select the most festive bunch to compete for a prize. More event details to follow, and please stay tuned to Elysian’s GPBF page as we fill in specifics like participating breweries, food vendors, and activities. For now, get your tickets, plan your costume – and we’ll see you there! Quick note for all you Pumpkinfest fans – The weekend prior to GPBF, on Saturday, September 23rd, we will be hosting the 5th Annual Great Pumpkin Weigh-Off at our Production Brewery in Seattle’s Georgetown neighborhood. Ticket price includes a Great Pumpkin Beer Festival snifter glass and 6 drink tickets. Additional drink tickets will be sold at the festival for $2 each. $5/day :: Online Only (no drink tickets or glassware included) Non-alcoholic beverages will be available. Calling local homebrewers who also love Georgetown Brewing….come on out for an AHA Rally next weekend. WHAT: The American Homebrewers Association (AHA) hosts a series of AHA Rallies nationwide to give homebrewers the chance to check out some of their local breweries and connect with other beer enthusiasts and homebrewers in their area. This upcoming AHA Rally will take place at Georgetown Brewing Company on September 9th. This event offers the opportunity to take a VIP brewery tour, enjoy beer samples, meet Georgetown brewers and staff, and bring home great prizes. Plus, all attendees will take home a Rally-exclusive gift from the AHA! Full Rally details can be found here. COST: Rallies are free for current AHA members. Non-members can join online, or sign up at the Rally and save up to 15%. Please RSVP for the event. Fresh Hop Throwdown in 2011. Thanks to +Russ for the pic. If you are a fan of fresh hop beers and live in Seattle, you won’t want to miss the 7th Annual Fresh Hop Throwdown at The Noble Fir in Ballard on Saturday, September 23. There are always a lot of fresh hop beers floating around during September and October, and some of us do everything we can to try as many different examples as possible. I’ll be working with Rick Weersing and Ellen Kelly of The Noble Fir to put together a lineup of about 16 different fresh hop beers that will all be available when the bar opens at 4pm. There will also be a private blind judging of the lineup earlier in the day and the winning brewery will be announced later at the event. Holy Mountain Brewing has taken top honors at the event for two years in a row. Will they make it a third, or will someone else take their spot? If you are new to fresh hop beers, this is a great event to introduce you to them. What is a fresh hop beer? Most of the annual crop is processed into dried hops that store well and will last throughout the year. Before hops are dried, they are known as “fresh hops” or “wet hops”. When beer is brewed with these fresh hops straight off the vine (or “bine”, to really be correct), it can impart a very unique flavor profile vs. the use of typical dried hops. 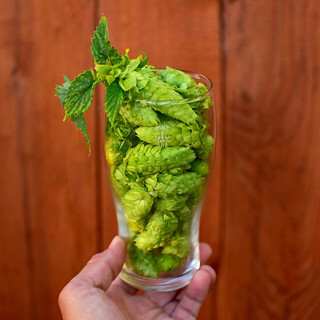 Fresh hops can impart a fresh, green, earthy hop taste, and they can really enhance the aroma of a beer. Some fresh hop beers are brewed exclusively with wet hops, while others are brewed with a combination of wet and dry hops. In addition to finding fresh hop beers on draft, you’ll be able to find bottled fresh hop beers from Sep to Nov. If anyone has questions about the event, feel free to send me an email. A limited number of tickets are available for an upcoming barrel blending workshop on Tuesday, September 19 at 6pm at Stoup Brewing, located in Ballard. Stoup teamed up with Wander Brewing, located in Bellingham, WA, for the Washington Beer Collaboration Festival, which was held this past weekend. Together, they made two different beers for the event: a hazy IPA named Mabel’s Brew, in honor of their first child born as the beer was finishing in tank, and Stave some for Me, a blend of barrels from both of our cellars. They had so much fun with the blending that they decided to follow the festival with a fun barrel blending exercise led by Brad and Robyn from Stoup & Chad from Wander. All attendees will learn the story behind both beers and have a chance to play with components in small groups, experimenting with various combinations. Each participant will also leave with 500ml each of 2 collaboration beers that were bottled exclusively for this event. There is only room for 40 people to attend this blending workshop. To purchase tickets please email info@stoupbrewing.com with a phone number and best time to call for over the phone ticket purchase. Emails will be addressed in the order received. My favorite time of the year is almost here. It’s tough to beat fresh hop beer season here in the Pacific Northwest. The unofficial kickoff of fresh hop season around here is the release of Two Beers Brewing Fresh Hop IPA. This year’s version will be released on August 23 at The Woods tasting room in SoDo. Cloudburst brewed a massive double IPA for the incredible event! And will have a bunch of other amazing things on draft too! Lost Abbey Cuvée de Tomme w/ Cherries ? And the list will continue to grow! Sarah’s World Famous Pina Colada! For the 2nd year in a row, the Washington Beer Commission is bringing together 56 different Washington breweries that have paired up to create 28 special beers. The beers will be pouring at the Collaboration Beer Festival on August 19 at the South Lake Union Discovery Center. The full list of collaborating breweries is below. Seattle, WA – The Washington Beer Commission is proud to announce the brewery pairing list for the 2nd Annual Collaboration Beer Festival at the South Lake Union Discovery Center lawn (101 Westlake Avenue North, Seattle, WA 98109). The event will feature 56 Washington Breweries pairing up to create and pour 28 unique, one-of-a-kind craft beer creations. The Collaboration Festival will take place on Saturday, August 19, between noon and 6pm. 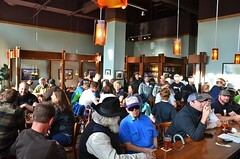 Tickets are available now at washingtonbeer.com and are $30 in advance or $35 at the door. Admission includes a tasting glass and 8 tasting tokens. Each taste is a 4 oz. pour. Additional tokens available to purchase for $2.00 each, or three tokens for $5.00. Take a look at the terrific list of Washington brewery pairings below and imagine what tasty creations they might come up with together. The complete beer list will be available on August 3. In addition to the collaborative beers there will also be a number of individual brewery favorites and some terrific food for purchase from local food trucks. If you are sitting around at work planning your weekend, you might want to think about drinking some sour beer tomorrow. There are two events taking place this Saturday with pretty great beer lists. Up in Roosevelt, Toronado will be hosting Washington Sour Beer Night starting at 3pm. They will be tapping a keg of their 1st anniversary beer from Holy Mountain, and they’ll have sours on tap from around 10 other Washington breweries. The lineup will include a couple of beers from the new Dirty Couch Brewing, which has just recently started distributing sour/wild beers from their Ballard brewery and barrel-aging facility. To read more about Dirty Couch, check out my Seattle column from the current issue of the Northwest Brewing News. Full beer list is below. In the Central District, Chuck’s Hop Shop is throwing its For the Funk of It Sour Beer Festival. The tentative draft list includes 30+ sour beers, featuring gems from Firestone Walker, Cascade, Holy Mountain, Urban Family and much more. The fun starts when they open at 11am. Full list is below.